Identification: This is a small species with alternating long and short pairs of cerata on its notum. There are several long papillae on the rhinophore sheaths and the oral veil has short processes. Its body is translucent white. Some animals are finely reticulated with opaque white and have opaque white outlining an irregular band that runs down the notum and branches onto the bases of the cerata. Others are finely flecked with white and decorated with small brown spots that may or may not outline a band on the notum. In both color forms, there are many small tubercles on the margins of the notum. Juveniles may have disproportionately short cerata, sometimes positioned far toward the posterior end of the body. 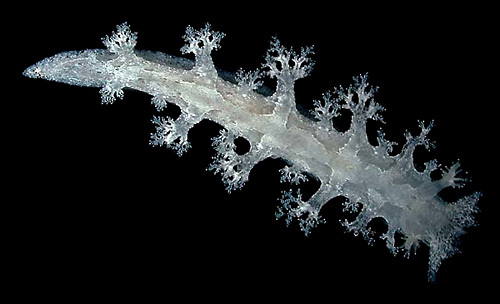 Natural history: Tritoniopsis sp. #1 is rarely found at moderately exposed to exposed rocky sites from < 1 to 3 m (< 3 to 10 ft). In that habitat, it probably feeds on the blue octocoral Sarcothelia edmondsoni since we've observed it doing so in dishes. It appears to be more common in deeper water where it feeds on the introduced octocoral Carijoa riisei. It has also been observed feeding on the octocoral Sinularia densa in the laboratory. (Wagner, Kahng, & Toonen, 2007) It lays a tightly coiled, white egg mass that hatches in about four days in the laboratory. Distribution: Big Island, Maui and Oahu: possibly also known from the western Pacific. Photo: CP: 12 mm; banded: Hekili Point, Maui; May 3, 2004. Note 1: Although there is some possibility that the two major color forms could be different species, the similarity in tubercle distribution supports lumping. Perhaps, the differences in color are due to diet? Daniel Wagner reports that "Tritoniopsis turned darker when moved from tanks containing only Carijoa sp. to tanks containing Sinularia densa and Sarcothelia edmonsoni." (pers. com.) But, the relationship is probably complex since our animals (collected from S. edmondsoni habitat) were quite light. Also, both large and small animals have been found that show the two major patterns.